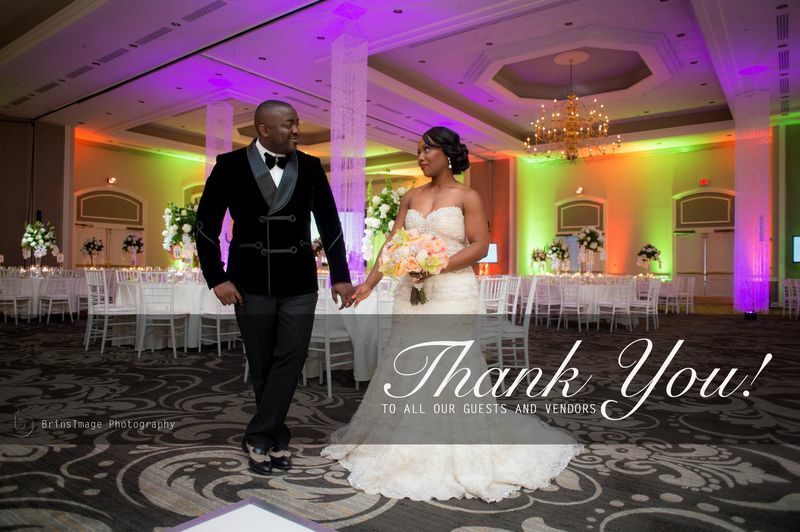 Any way you dice it, Dr. Bertrand Fote and Laura Ayuk-Takem’s wedding on Saturday, August 30th 2014 in Charlotte, North Carolina, was one for the books. I always knew Bertrand Fote’s wedding would be a multilayered event. Why? The young man is simply in a class of his own, ER Physician, MBA, Poet, Fashion designer, financial counselor, etc. The only thing that bothered those of us who knew him was who would be that bride. Our wait was proving long and with one false start, it was getting to crunch time. But our human timing is never the best. Unbeknownst to Bertrand, there was a right match just around the corner and in God’s own time she came: The intelligent, beautiful, cool, collected, poised and sultry Miss Laura Ayuk-Takem. They had both been raised in Yaoundé, the capital of Cameroon, and after spending several years in Uncle Sam’s land they are still steeped in their ethnic identities to be proud ambassadors of their respective ancestral homes in Bameka and Besongabang; In addition, they are both health care professionals, but above all they both possess unshakable faith in a higher power. Consequently, Bertrand had not only found a team player he had found a soul mate which made planning the big wedding day quite easy because they had their feet firmly rooted on mutual soil. 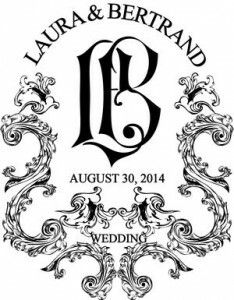 The Logo by Leeland designs which accomapnied all wedding paraphernalia. After a couple’s shower in June, a bridal party on Thursday 28th and a bachelor’s night on Friday 29th, all was set for D- day, Saturday August 30th 2014. It was a whole production waiting to happen complete with special lighting and “high tech” audio visual and sound engineering courtesy of Scott Brown Media Group. Indeed, there was no denying that Bertrand and Laura had assembled the best team in the business. The church service took place at St Mathew Catholic church. The morning was crisp and festive as elegantly dressed guests, Crème de la Crème, waited for the Bridal party to arrive. But the groom was nowhere to be found. Before long, the groomsmen donning suits from 4J couture sauntered in, followed by flower girls, and then in came the bridesmaids. By every indication, the bride was at the door. Everyone was confused. Something was not right. Where was Bertrand? Then the sound of piano music rent the air. No one could see where the music was coming from. Suddenly a voice became audible above the piano sound and Bertrand appeared… singing, “I do Cherish You” by 98 degrees for his bride. His voice drowned her in sweetness which she collected in her heart as her body responded with a slow deliberate majestic walk. Leaning on the arm of her brother, Dr. Lambert Ayuk-Takem, her face radiated joy. Yes, Celine Dion captured it effectively: For moments like this, some people wait a life time! Yet for some of us who know something about the bride, we could tell there was a little melancholy under her eyelids; she would have loved to look into her father’s eyes in gratitude at that time. But all was well, the Late Dr. Jacob A. Ayuk-Takem, former Minister of Scientific and Technical Research, was watching his little girl from above and must have induced some energy into her as she mustered a sweet smile to the adoring crowd. But nothing was left to chance. On her way to the altar, there was a table with pictures not just of her late father and mother, but also of the groom’s late father, Mr. Athanasius Fote. With blessings from these three from above, the effervescent presence of the groom’s mother, Mrs. Bertha Fote and the groom’s American based “parents”, the Samutos, the church service commenced in earnest. The guests floated in their own dreams as the service unfolded. That surreal entry was just a taste of what was to come. Laura’s Karma: Bailey’s Irish Cream, Vodka on the Rocks. While some guests warmed their taste buds with these hot cocktail recipes, others were lost in the fruit paradise served with class and panache by Emerald Delite’s Dr. Helen Ashuntantang. 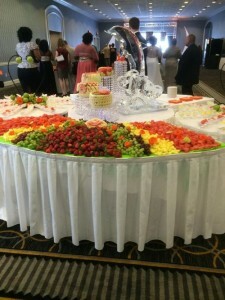 It was a display with total pizazz that took tongues for a ride while pupils dilated in awe at the fruit art, crystal centerpiece and ice sculpture that collectively showcased the creative prowess of a gifted fruit carver and stylist. 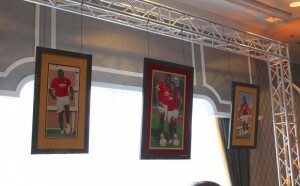 But that was not all, at the far end of the cocktail corridor was a mounted picture gallery of Dr. and Mrs. Fote in their matching Manchester United outfits revealing that they were indeed a dream team. Anyone who knows anything about soccer knows that the numbers on their jerseys metaphorically captured something deeper. Laura is not just Bertrand’s number 1 babe, she is a keeper. On the other hand Bertrand’s number 4 does not just conjure his name, “Fote” it shows he is the first line of defense of the dream team. However, when all is said and done she is the one between his goal posts ready to make important saves. Yes, you know a man is on safe ground when his wife becomes a fan of his favorite soccer club! In sum, this cocktail hour was innovation heaven. Even the cocktail snacks which reflected the couple’s multicultural background were symptomatic of the culinary extravaganza to come. Cocktail hour over, it was time to enter the Symphony Ballroom at the Sheraton for the wedding reception. Just a peak at the door left guests gasping in wonder. Ms. Lee Sendze of LEELAND Designs had done it again! The view from the door cast a spell on the guests as they slowly identified their tables and sat down. The planner had gone for a classy look. 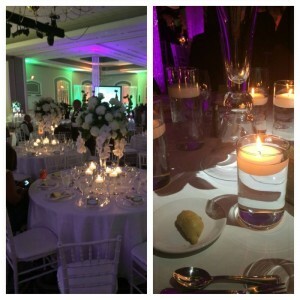 The chairs were all white and the round tables were covered with white table cloth. The flower centerpiece by Lingky was a fine blend of Oriental Lilies, Roses, China mums and some special orchids. Like the Lingky slogan puts it, it was an elegant floral arrangement for elegant individuals! As the guests all sat down it was time to begin. The emcees were ready. Their range again showed that the couple aimed for the best in every aspect. On one hand was Mr. Bendrix Tabu whose fame as a comedian is growing like bush fire in the harmattan, as Achebe would put it, and yours truly, whom the couple fondly refer to as a “linguistic maestro”. In fact, one of my friends who was not at the wedding forwarded a text that had been sent to her. It read in part, “Joyce’s eloquent and charming voice coupled with her rich diction dovetailed around Mr. Bendrix’ jokes making this a most splendid evening.” I could not have put it any better. Applause followed applause! This was the one of the many high points of the wedding. As the movie ended the guests were in awe, wondering what was going to happen next. This time the groom did not go to the hospital. 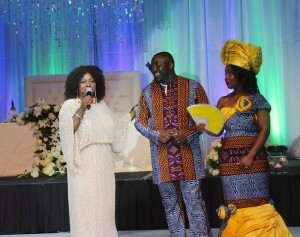 He appeared live on stage dancing to Michael Jackson’s “Working Day and Night” He gyrated, twirled and moonwalked to resounding applause; then the song changed to, “Have you seen my beautiful baby?” And the airwaves surrendered to Flavour’s “Ada”, as the effectively groomed groomsmen joined the groom led by Best Men, Dr. J and Heine Zumafor and dressed in suave blue tuxedos, another 4J couture outfit. Before long the music changed to Don Tom’s “I don see my wife oh” as the bride entered with her brainy-beautiful bridesmaids led by her two maids of honor, her sister Dr. Shirley Ayuk-Takem and friend, Ms. Kasama Mancho. It was another role-play as the bride taunted the groom and he tried to win her over with different songs capturing the mood of their romance. By the time it was over the audience had been thoroughly entertained while being veritable witnesses to the magnificence of team work. In between these activities the guests had over an hour to experience the depths of Taba Eseme’s culinary expertise. With recipes that have been passed down from generation to generation in his ancestral Cameroon, Taba presented a buffet that has left Sheraton management scrambling to put their label on him. The food was not only tasty and in abundance, it was fresh and served with gusto! Meanwhile the four bars stationed at different corners of the banquet hall catered to every craving – from essential liquids to exotic liquor. While guests ate and drank, some preferred to use the free photo booth outside the banquet hall to take memorable photos to capture the day. Keeping with the tempo of the wedding, the captivating music by DJ Tambe served as an effective bridge punctuating each group of activities as guests danced the night way. By the time the bridal party made their traditional entry- the verdict was already written in the stars. This was a well-executed wedding production. After a series of stunning 4J Couture jacktes/pants worn by the groom, he went for a relaxed traditional outfit while the bride kept up her unique elegance even in her traditional wear. The manyu crowd stole the show here briefly as they surprised Laura with their dance and uniformed wrappers courtesy of Annette Aksdal. However, the spotlight remained on the couple. Like with everything else about this wedding, the choice of the traditional fabric for the couple was certainly not random; it is a design associated with the western region of Cameroon where the groom hails from. Like Ruth in the Bible, Laura through that fabric was saying, “your people shall be my people and your God shall be my God”. It got to that time! The symphony Banquet hall had been booked till 4.am but by 3 a.m the guests started leaving strenuously, their gait revealing their satisfaction as most women now changed into slippers or simply had their high heels in their hands while leaning on the willing shoulders of very exhausted men. It had been a long day but that did not stop the guests from showing up at the BBQ the next day for another taste of Bertrand and Laura’s largesse. Well, the BBQ story will have to wait for another day. Like I said during the wedding, Love is a wonderful thing, when you find it, give it a home. Bertrand and Laura found love and they have given it a home in their hearts and house. For those of us who were chosen by destiny to be witnesses, we would live to narrate the events of August 30th 2014 to our children and our children’s children. 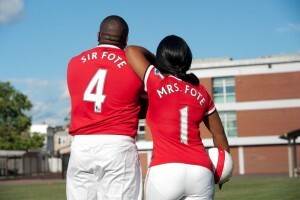 I can only wish Dr. and Mrs Fote a happy married life! Sit back, relax and browse through the program booklet Download Fote-Wedding Booklet. Get to meet all the beautiful people who brought this wedding production into reality.